The fatigue evaluation procedures outlined in this advisory circular are for guidance purposes only and are not mandatory nor regulatory in nature. Although a uniform approach to fatigue evaluation is desirable, it is recognized that in such a complex problem, new design features and methods of fabrication, new approaches to fatigue evaluation, and new configurations may require variations and deviations from the procedures described herein. Engineering judgment should therefore be exercised for each particular application. a. The flight structure of the rotorcraft is subject to vibratory stresses in practically every regime of flight. In addition, since it is a highly maneuverable aircraft that is capable of forward, rearward, sideward, vertical, and rotational flight, operating limitations due to fatigue are possible in practically all flight situations. For these reasons, it is required that special attention be focused on the fatigue evaluation of the flight structure of the rotorcraft. b. Fatigue evaluation of the flight structure is intended to verify structural reliability. Assurance of structural reliability starts with design, including choice of materials for resistance to crack initiation and/or propagation, detail design to minimize stress concentration, and specification of surface finishes, fits, etc. Design analysis should include estimation of expected flight loads, and estimation of resistance to fatigue. Fatigue strength should be based on past full scale fatigue tests and/or materials fatigue data with appropriate reductions for the variability in fatigue strength, size, shape, surface finish, and environments of the structure. In addition, design for fatigue should consider mode-of-failure analysis, areas susceptible to fatigue cracking, and methods to assure detectability of fatigue cracks. The residual strength of a cracked structure is an important consideration of failsafe design. c. Assurance of structural reliability also includes manufacture and fabrication in accordance with design requirements and specifications, quality control to monitor compliance, and effective service inspection procedures. d. Fatigue evaluation of the structure, measurement of flight loads and stresses, and evaluation of fatigue strength and/or fatigue crack propagation are the subjects of this advisory circular. There is some question whether a completely reliable method for the prediction of time to fatigue crack initiation and fracture exists. Nevertheless, one engineering approach to the subject is to use the "Linear Cumulative Damage Hypothesis." This hypothesis states that every cycle of stress above an "endurance limit" produces fatigue damage proportional to the ratio of cycles accumulated at the stress to fatigue "life" at that stress. e. Laboratory tests of this hypothesis indicate that it is reasonably valid when the loading spectrum consists of stresses which are, in effect, random. Despite the lack of an adequate theory connecting this hypothesis with more basic properties of materials, it has been successfully used in a number of applications. f. In addition, fatigue evaluation generally requires a method of accounting for the effect of steady loads and stresses on fatigue. Where the manufacturer does not provide other substantiating data, a Goodman diagram may be used to account for these effects. (1) Identification of the structure to be considered in the fatigue evaluation. (2) The stresses associated with steady and maneuvering operating conditions expected in service. (3) The frequency of occurrences associated with various flight conditions and the corresponding spectrum of loadings and stresses. (4) The fatigue strength, fatigue crack propagation characteristics of the structure, and the residual strength of the cracked structure. Subsequent to design analysis, in which aircraft loads and associated stresses are derived, the stress level and/or loads are to be verified by a carefully controlled flight strain measurement program. a. The instrumentation system used in the flight strain measurement program should accurately measure and record the critical strains under test conditions associated with normal operation and specific maneuvers. The location and distribution of the strain gauges should be based on a rational evaluation of the critical stress areas. This may be accomplished by appropriate analytical means, supplemented, when deemed necessary, by strain sensitive coatings or photoelastic methods. The distribution and number of strain gauges must define the load spectrum adequately for each part essential to the safe operation of the rotorcraft. b. 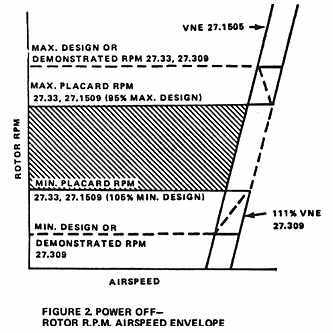 The corresponding flight parameters (airspeed, rotor rpm, center of gravity accelerations, etc.) should also be recorded simultaneously by appropriate methods. This is necessary in order to correlate the loads and stresses with the maneuver or operating condition at which they occurred. c. The instrumentation system should be adequately calibrated and checked periodically throughout the flight strain measurement program in order to ensure consistent and accurate results. PARTS TO BE STRAIN GAUGED. Fatigue critical portions of the rotor systems, control systems, fuselage, and supporting structure for rotors, transmission, and engine are to be strain gauged. For rotorcraft of unusual or unique design, special consideration might be necessary to insure that all of the essential parts are evaluated. FLIGHT REGIMES AND CONDITIONS TO BE INVESTIGATED. a. Typical flight and ground conditions to be investigated in the flight strain measurement program are given in Table 1. Flight regimes that should be investigated for power-on and power-off operation are shown in Figures 1 and 2. For clarity, the parameters which define these regimes are included in these figures. As noted on Figure 1, complete coverage at 111 percent Vne should be demonstrated for power-on operation. However, for power-off operation, Figure 2, complete coverage at 111 percent Vne for maximum and minimum design rpm need not be obtained if points are obtained at Vne at both maximum and minimum design rpm and at 111 percent Vne at both maximum and minimum placarded rpm as indicated in the figure. b. The determination of flight conditions to be investigated in the flight strain measurement program should be based on the anticipated use of the helicopter, and, if available, on past service records for similar designs. In any event, the flight conditions considered appropriate for the design and application should be representative of the actual operation in accordance with the rotorcraft flight manual. In the case of multiengine helicopters, the flight conditions concerning partial engine-out operation should be considered in addition to complete power-off operation. The flight conditions to be investigated should be submitted in connection with the flight evaluation program. Suggested flight conditions for single engine helicopters used in normal operation are shown in Table 1.
c. The severity of the maneuvers investigated during the flight strain survey should be such that it is unlikely that service use will be more severe. d. All flight conditions considered appropriate for the particular design are to be investigated over the complete rotor speed, airspeed, center of gravity, altitude, and weight ranges in order to determine the most critical stress levels associated with each flight condition. In order to account for data scatter and to determine the stress levels present, a sufficient amount of data points should be obtained at each flight condition. In some instances, the critical weight, center of gravity, and altitude ranges for the various maneuvers can be based on past experience with similar designs. This procedure is acceptable where adequate flight tests are performed to substantiate such selections. The combinations of flight parameters that produce the most critical stress levels should be included in the fatigue evaluation. The probable types of operation (transport, utility, etc.) for the rotorcraft should be established. The type of operation can have a major influence on the loading environment. Normally, the rotorcraft should be substantiated for the most critical general type of operation with consideration of special occasional types of operation. 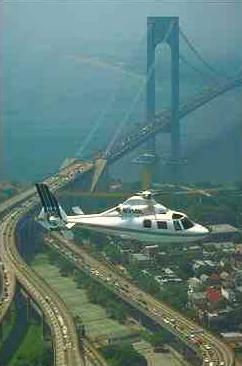 The spectrum allocating percentages of time or frequencies of occurrence to flight conditions or maneuvers is to be based on the expected usage of the rotorcraft. This spectrum is to be such that it is unlikely that actual usage will subject the structure to damage beyond that associated with the spectrum. Considerations to be included in developing this spectrum should include prior knowledge based on flight history recorder data, design limitations established in compliance with FARs 27.309 or 29.309 and recommended operating conditions and limitations specified in the rotorcraft flight manual. 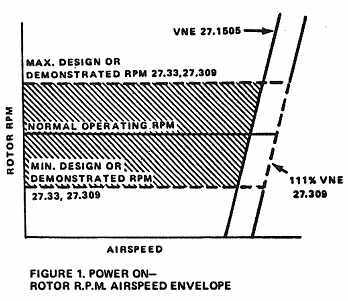 The distribution of times at various forward flight speeds should reflect not only the relation of these speeds to Vne but also the recommended operating conditions in the rotorcraft flight manual which govern Vc or cruise speed. Where possible, it is desirable to conduct the flight strain gauge program by simulating the usage as determined above, with continuous recording of stresses and loads, thus obtaining directly the stress/load spectra for structural elements. Table 1 contains typical percent of occurrences for the various flight conditions for single engine piston helicopters used in utility operations. This table should be used only as a guide and should be modified as necessary for each particular rotorcraft. It is recognized that if allowable stress levels are established by acceptable means, and the stresses measured in flight are lower than these established levels, no fatigue testing is necessary. (1) Estimate the mean endurance limit of the part from test results of specimens with similar stress concentrations. The test specimen material should be representative of the actual part and sufficient test data should be available to substantiate the mean endurance limit. The estimate should account for surface conditions, fabrication methods, fretting, size and shape effects, as well as differences in stress concentrations between the test specimen and the actual part. Referring to Figure 3, the mean endurance limit may be represented by a straight line drawn through the yield stress (point A on the horizontal axis) and the maximum oscillatory stress which the average specimen can withstand at a given steady stress (Point B) without failure for 10^7 to 5 x 10^7 cycles depending on the material. (2) A factor of safety of 3 should then be applied to the mean endurance limit so that the slope of line AC would be 1/3 of line AB. A smaller factor is acceptable when substantiated by a sufficient number of tests on similar parts in similar applications. (3) If the flight strain measurements indicate that all of operating stresses fall below the operating boundary line (AC), no fatigue testing is necessary. When the measured stresses are above the operating boundary line, however, fatigue testing of the actual parts should be conducted. (a) Large parts in proportion to the laboratory specimens. (b) Irregularly shaped parts containing numerous or superimposed fillets, holes, threads, or lugs. (c) Parts of unique design for which no past service experience is available. (d) Parts subject to fretting. (e) Bolted or pinned connections. b. Rational methods. Methods may be used which do not involve full scale testing but which apply the variables of fatigue strength with a calculation of retirement times in a manner that provides equivalent reliability to the fatigue testing and simplified methods and is acceptable to the Administrator. The fatigue strength of the flight structure may be determined in appropriate laboratory tests and evaluated in terms of a loading spectrum. The strength indicated by the test results should be reduced by a factor such that a replacement time based directly on this reduced strength level and the loading spectrum of paragraph 7 will assure that the probability of failure is extremely remote. This reduction factor should be based on consideration of the number of specimens tested, the variability of the fatigue results, the effects of service use, and, where available, previous test data for the same material or similar components as well as service experience. The test methods outlined below are considered acceptable. 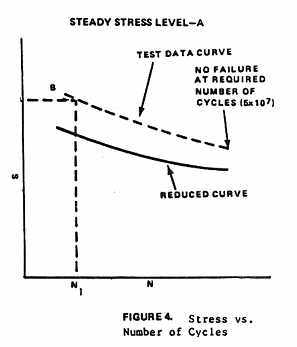 (1) Fatigue tests should be conducted over a range of oscillatory stresses or loads to define the S-N curves. Fatigue tests should be performed at steady stresses or loads representative of those occurring in flight. (2) In order to determine the mean fatigue strength and the variability in fatigue strength, it is necessary to test a number of specimens in establishing S-N curves. In order to account for the variability in fatigue strength, a reduction factor should be applied to the mean curve in arriving at a working S-N curve. This factor should include consideration of the number of specimens tested, the variability of the fatigue results, and, where available, previous test data on the same material or similar components, as well as service experience. Where new materials or designs are being evaluated, it is recommended that a larger reduction factor be used until such time as additional test data justifying a change are available. The mean and reduced S-N curve should reflect the curve shapes of typical published S-N data on notched or unnotched specimens, as applicable. The reduced S-N curve and the loading spectrum of paragraph 7 should be used in determining replacement times. Figure 4 represents the method of constructing a typical S-N curve from the fatigue test data. (b) Stress histories based on flight test data obtained for flight and ground conditions and maneuvers considered appropriate for the particular rotorcraft, and a spectrum allocating percentages of time or frequencies of occurrence to these flight and ground conditions and maneuvers. (2) Fatigue tests in which the loading spectra are applied such that effective randomization of loadings is obtained. (3) Unless performed prior to step (1), determining by flight test the stress levels associated with each flight condition and maneuver considered appropriate for the particular rotorcraft. (4) Assignment of replacement times. The fatigue test results should be evaluated in terms of the loading spectrum of paragraph 7 (if different than test spectrum) and reduced by a factor considering the number of specimens, the fatigue strength variability, and applicable prior data, in arriving at a replacement time. c. Major system tests. Another method of determining the replacement times is to perform a fatigue test or tests of the major systems. Examples of such testing are whirl tests, tiedown tests, and bench tests. The test results should be evaluated in terms of the loading spectrum of paragraph 7 (if different from test loading) and reduced by a factor considering number of specimens tested, variability in results, and applicable prior test data in arriving at a replacement time. COMBINATION OF REPLACEMENT TIME AND FAILSAFE EVALUATION. It may be possible to extend the replacement time of safelife components which exhibit limited failsafe capability by using a combination of the safelife and failsafe concepts. This is accomplished by evaluating both the fatigue strength and failsafe characteristics as described elsewhere in this circular and by assigning both a replacement time and inspection period to these components. The replacement time may then be based on the combined probability of not initiating a fatigue crack at or before the replacement time and the probability that the crack if initiated will be detected prior to catastrophic failure or loss of limit load (or maximum attainable load, whichever is less) carrying capability. The probability of detection should be based on consideration of the inspection effectiveness, the inspection interval, and the fatigue life remaining after an obvious partial failure. A lower strength reduction factor, commensurate with this probability of detection, may then be used in the determination of the replacement time. a. Recorded load data. Recording load data entails instrumenting aircraft in service to obtain a representative sampling of actual loads experienced. The data measured should include airspeed, altitude, and rotor speed versus time, or the airspeed, altitude, and strain ranges versus time, or similar data. The data obtained by instrumenting aircraft in service should provide a basis for correlating the estimated loading spectrum with the actual service experience. b. Additional analyses and tests. If test data and analyses based on repeated load tests of additional specimens are obtained, a re-evaluation of the initial strength reduction or scatter factor may be made. c. Tests of parts removed from service. Where conservatism was used in initial calculation of replacement times because of lack of knowledge of service environment, repeated tests of replaced parts may be utilized to re-evaluate the initial scatter factor selected. The tests should closely simulate service loading conditions. d. Rework of the structure. In some cases, rework of the structure may result in an increase in replacement time. a. Selection of materials and stress levels that provide a controlled slow rate of crack propagation combined with high residual strength after initiation of cracks. b. Design to permit detection of cracks including the use of crack detection systems, in all critical structural elements before the cracks can become dangerous or result in appreciable strength loss, and to permit replacement or repair. c. Use of multipath construction and the provision of crack stoppers to limit the growth of cracks. d. Use of composite duplicate structures so that a fatigue crack or failure occurring in one element of the composite member will be confined to that element and the remaining structure will still possess appreciable load carrying ability. e. Use of backup structure wherein one member carries all the load, with a second member available and capable of assuming the extra load if the primary member fails. IDENTIFICATION OF CRITICAL PORTIONS OF FLIGHT STRUCTURE. a. Rotor blades and attachment fittings. b. Rotor heads, including hubs, hinges, dampers. c. Control system components, including control rods, servos, swashplates. e. Fuselage, including stabilizers and auxiliary lifting surfaces. The extent of the partial failure is to be such that it would be readily detectable during the specified inspection. It may involve complete failure of a principal element, failure of more than one element, or only a partial failure of an element depending on the rate of crack propagation, the ease of detection, and the inspection interval. Damage in inaccessible areas should extend into inspectable areas. a. Cracks emanating from the edge of structural openings or cutouts which can be readily detected by visual inspection of the area. b. A circumferential or longitudinal skin crack in the basic fuselage structure of such a length that it can be readily detected by a visual inspection of the surface area. c. Complete severance of interior frame elements or stiffeners in addition to a visually detectable crack in the adjacent skin. d. Failure of one element where dual construction is utilized in components. e. Failure of primary attachments, including control hinges and fittings. DETERMINATION OF PROBABLE CRACK LOCATIONS. a. Conducting an analysis to locate areas of maximum stress and low margin of safety. b. Conducting strain surveys on undamaged structure to establish points of high stress concentration as well as the magnitude of such concentration. c. Examining static test results to determine locations where excessive deformation occurred. d. Determining from fatigue analysis where cracks may initiate. e. Selecting locations in an element where the stresses in adjacent elements would be the maximum with that element failed. g. Assessing design detail areas which are prone to fatigue damage based on service experience records of similarly designed components. It is to be demonstrated by analysis, tests, or both, that the structure with the partial failures as defined in paragraphs 15 and 16 can withstand the maximum load and the repeated loads expected in service during the period prior to detection. The repeated loads should be as defined in the loading spectrum of paragraph 7 and the structure should be capable of supporting this loading after a partial failure for a sufficient time with respect to the inspection interval to assure that catastrophic failure is extremely remote. The loading spectrum should include at least one application of limit load. In test demonstrations, the damage may be initiated or simulated by cuts made with a fine saw, sharp blade, or guillotine in those cases where it is not necessary and not practical to produce fatigue cracks by tests. In those cases where damage is simulated at joints or fittings, bolts may be removed to simulate failure if this condition would be representative of an actual failure. In some instances, the failsafe characteristics may be shown analytically. The analytical approach may be used when the structural configuration involved is essentially similar to one already verified by failsafe tests, whether on a previously approved type design, or on other similar areas of the design currently being evaluated. The analytical approach may also be used when: (1) it can be shown that the failure would be detected considerably before the critical crack length is approached; (2) the margins of safety resulting from the analysis are well in excess of the failsafe residual static strength level; and (3) the stress levels in the partially failed structure and the design are such as to assure adequate crack propagation time relative to the inspection interval. Detection of fatigue cracks before they become dangerous is the ultimate control in insuring the failsafe characteristics of the structure. Therefore, the manufacturer should provide sufficient guidance information to assist operators in establishing the frequency and extent of the repeated inspections of the critical structure.